Gaming has evolved from a single-player, one console experience to an interconnected network of millions of players and thousands of downloadable games. With such a broad reach and level of connectivity, online gaming is something that parents need to understand and regulate in order to keep their children playing safely. Parents should get to know the different type of gaming platforms. Parents usually think of gaming as something kids play on consoles (like an Xbox 360, PlayStation 3 or Wii) and hand-held devices (like a Nintendo DS). But games are also commonly played on computers, tablets, and smartphones, as well as in web browsers and through social sites. They come in a variety of styles. Ask your child which platforms they are playing and familiarize yourself with that style of gaming. Set a strong password. Whenever possible use a password that is at least eight characters and includes at least one number, letter, and symbol. Avoid using the same exact password for every login. Protect personal information. Do not create accounts that use your personal information. Create vague usernames that do not include your personal details (username YankeesFan01 instead of TomSmith01). Never list or offer up your location, gender, and age. Hide physical features. Some games include voice and/or video chat. Do not use either of these items unless you are able to disguise yourself, and do not post a personal photo to your user profile. Use an avatar instead. Avoid uncomfortable interactions. If another user makes you uncomfortable with their tone, language or dialog, remove yourself from the situation. Tell an adult and block the player. Trust your gut. If the situation feels unnatural, it is more than likely inappropriate. Understand the limits of online friends. Online friends should remain online friends. Never agree to meet a player in real life. Always ask before downloading or buying a new game or upgrade. Never download a game without parental permission. This is especially true for paid games. Parents need to review each game before giving permission for play. Never accept a download or a “mod” from another user. Other users may offer codes, mods (modifications), or downloads to you (often saying it will improve your performance in the game). Never accept those requests as they may include malware which is harmful to your console, computer, or phone. Set a time limit. Don’t game all day and night. Set a time limit for use each day. Play out in the open. If kids are playing by the rules, there should be no reason that they can’t play where their parents can see it. Parents should keep game consoles in the open and periodically check-in while kids are playing. The Entertainment Software Rating Board utilizes a Rating Guide so parents and users are aware of the game’s contents and capabilities before playing. Use this rating system to determine which games are right for your kids. Interactive Elements Ratings explain the sharing and interactive capabilities of the game. Use these ratings to see what information will be collected and possibly shared, and to see how users are able to interact with each other. Rating Categories suggest the age appropriateness of the game. Content Descriptors explain which elements of the game factored into its rating category, such as alcohol reference, cartoon violence, language, etc. There are about two dozen different descriptions so use the ESRB’s full list of content descriptors to evaluate the content of the game. 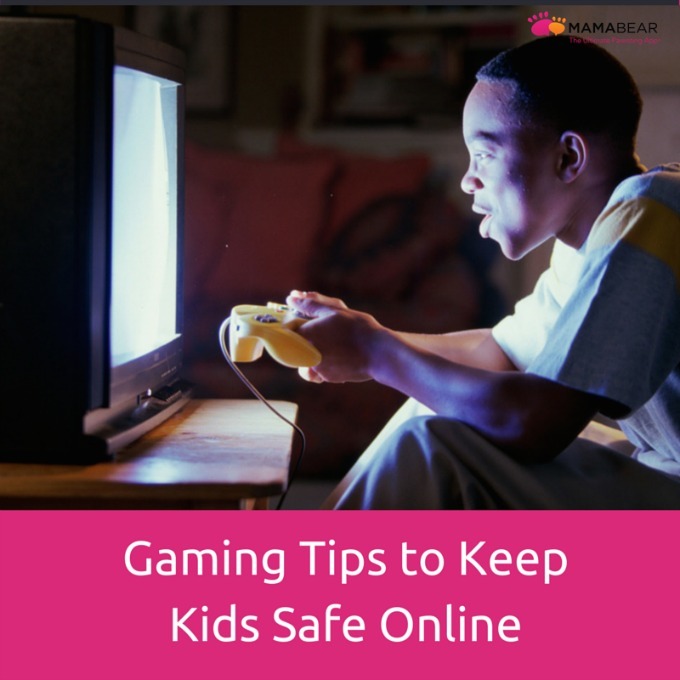 Keeping your child safe with online gaming requires time and diligence but risks associated outweigh the investment of time. See how MamaBear can easily help you connect with and protect your child through your iPhone or Android device. These are great tips. Strong passwords are very, very necessary. Never underestimate the nimble minds and fingers of kids. Your simple password combination of your high school locker key as well as your birthday can easily be decoded by your tech savvy kid. Ensure that they understand the dangers of talking to strangers online as well. Even if they say they know, you still have to check from time to time. Great tips, most especially the ratings.